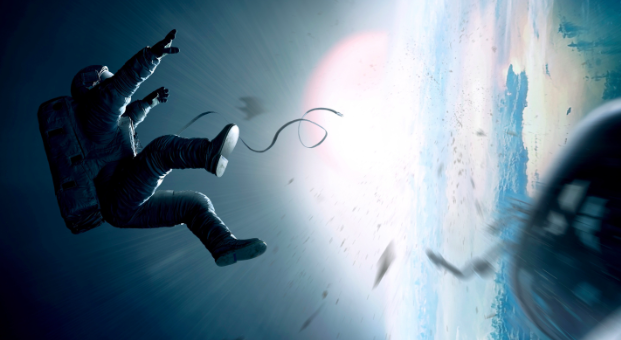 In space no one can hear you scream, or cry or even contact you…worst case scenario right? Well that’s what Sandra Bullock found in the electrifying Gravity which premiered at the London Film Festival and is now on general release. From its outset, the film follows a very simple storyline, however Director Alfonso Cuaron manages to create something truly magical with the use of brand new technology, which took four and a half years to perfect, and shoot, and boy was it worth it! The story follows Dr. Ryan Stone (Sandra Bullock) who is a brilliant medical engineer on her first shuttle mission, with veteran astronaut Matt Kowalski (George Clooney) in command of his last flight before retiring. On a seemingly routine spacewalk, disaster strikes. The shuttle is destroyed, leaving Stone and Kowalski completely alone – tethered to nothing but each other and spiralling out into the blackness. From the moment the film starts, as an audience member you feel like you’re out there with them. My advice if you’re planning on catching a showing, is that it would be best to definitely sit as close to the screen as possible, or even better, catch it in IMAX format so you can feel completely absorbed, which makes the cinematic experience even more powerful. The genius element behind Gravity is that every movement feels weightless, and the camera panning is so seamless its like there is a crew out in space with them at all times. Cuaron most definitely has thought of every detail, and although the performances (particularly Sandra Bullock) are brilliant, it’s not the powerful acting that you walk away from feeling captivated by, it’s the thought of…how did they film that? To be honest, if I hadn’t have dug a little detail for clarification, and you told me it was shot in space, judging by the quality I’d be inclined to believe you – yes readers, Gravity is that good! The 3D element is used in a subtle yet powerful way. The odd bits of debris that come hurtling towards you are not over used, but timed perfectly, as by that point, you’re probably on your second or third anxiety attack! With the 3D element, the depth in which Cuaron demonstrates space is amplified, and helps to make you feel claustrophobic in ironically the most open space in the universe, yet again proving that every element of this film has been plotted and explored extensively. It’s with little doubt that Sandra Bullock should lead the way at awards season, her performance, or should I say for the majority solo performance, is commanding, compassionate and determined. Her dance skills also came into play with demonstrating weightlessness within the various space capsules she eventually finds herself in, and judging by the way she pulls them off, that would have taken months of preparation and provides beautiful shots. On the other hand, George Clooney plays a brilliant supporting role as a cool and calm mentor to the rookie throughout. The third element, which helps viewers truly absorb this film, is the sound design. It’s very rare that the audio elements can affect one in a way quite like this, but from the outset Glenn Freemantle’s inventive sound mix. From the opening credits the design is so over powering you feel it rattle in your chest only to then be faced with the vast universe and silence – its mind blowing how deeply this affects you from the outset, but very much sets the scene in a way never really been seen or heard before. So its not a question of whether or not you should bother to see Gravity or not, its more a question of how best to see it. The film has had the nod of authenticity from Buzz Aldrin and hailed as the greatest space movie ever made by James Cameron, so if you need clarification as to whether or not this is worth spending your hard earned cash on, then those testimonies should hopefully be enough. Undoubtedly there will be some sort of meteor storm around the Oscars and general award season and it will be very hard to find a competitor to pip Cuaron and his team to the awards for Best Picture, Best Director, Cinematography and Sound. Put two of my favourite actresses (Sally Hawkins and Cate Blanchett) in one film, add Woody Allen as a director and Boom! You’ve got what looks to be another acting masterclass…. 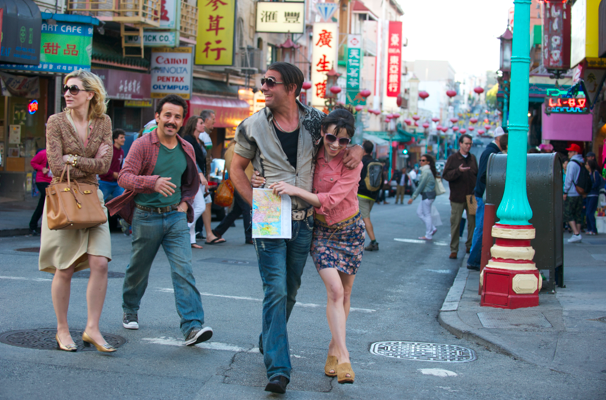 Jasmine arrives in San Francisco in a fragile mental state, her head reeling from the cocktail of anti-depressants she’s on. While still able to project her aristocratic bearing, Jasmine is emotionally precarious and lacks any practical ability to support herself. She disapproves of Ginger’s boyfriend Chili (Bobby Cannavale), who she considers another “loser” like Ginger’s ex-husband Augie (Andrew Dice Clay). Ginger, recognizing but not fully understanding her sister’s psychological instability, suggests that she pursue interior design, a career she correctly intuits that Jasmine won’t feel is beneath her. In the meantime, Jasmine begrudgingly accepts work as the receptionist in a dentist’s office, where she attracts the unwanted attentions of her boss, Dr. Flicker (Michael Stuhlbarg). Feeling that her sister might be right about her poor taste in men, Ginger starts seeing Al (Louis C.K. ), a sound engineer whom she considers as a step up from Chili. Jasmine sees a potential lifeline when she meets Dwight (Peter Sarsgaard), a diplomat who is quickly smitten with her beauty, sophistication and style. Director Shane Carruth’s second film follows his 2004 Sundance Grand Jury Prize winning “Primer” and takes you on an adventure of surrealism, disbelief, love and madness. Upstream Colour stretches the concept of an experimental film to a point where you are watching it for its beauty and precision rather than any specific meaning. The synopsis describes the experience as watching “a man and a woman who are drawn together, entangled in the lifecycle of an ageless organism. Identity becomes an illusion as they struggle to assemble the loose fragments of wrecked lives.” This in itself sounds complex, but you will find yourself getting swept up in the beauty of it all and intrigued to find out where this film could possibly lead. So in lamens terms, essentially you watch a girl, Kris, get drugged and kidnapped one night, and in an obedient hypnotic state, she gives away all of her money, lifestyle and previous conception of how a human should live to a petty drug dealing thief. Eventually, and as a result of this drugged state, she find herself at the hands of a pig farmer who has managed to join her life to that of a pig (in a much more lateral sense, rather than a Human Centipede sense). 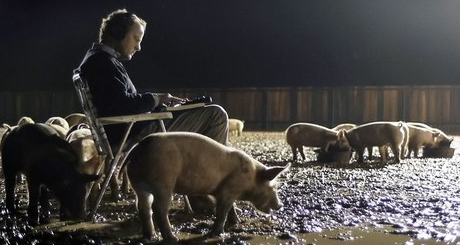 It quickly becomes apparent that Kris is not the only one who has fallen victim to this situation, and in fact a number of citizens live their life through the lives of pigs…which essentially allow the pig farmer to follow and co-ordinate their life choices as he sees fit. What message Carruth is trying to put across is baffling and may never be found, so if you’re looking for meaning over beauty, Upstream Colour will have the power to frustrate and annoy you. But with clever editing which keeps the action as cryptic for the audience as the characters themselves, sewing tiny fragments of this film together piece by piece, you’ll be coming away from this film discussing its fantastic cinematography and subtle but powerful acting rather than its narrative. Upstream Colour is definitely one for those of you who like to be pushed to your cerebral limits, but for those who want to stay well away from science fiction and the possibility of pigs ruling the earth, this may be one to miss out on, selective audiences only. The film hits cinemas in August. 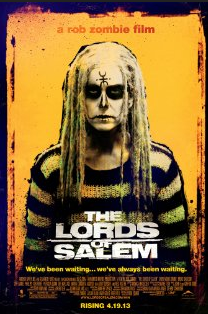 The Lords of Salem is the latest offering from Rob Zombie (Halloween, Halloween II). The writer, director, composer and rock music icon brings to screen a “chiller” film which follows the story of Heidi (Sheri Moon Zombie), a radio station DJ, who receives a wooden box containing a record given as “ a gift from the Lords.” Heidi listens to the ‘painful’ music, and eventually plays it on air during her show, which sends both herself and other ladies listening in Salem into a trance like state triggering flashbacks of the towns violent ‘witch riddled’ past. Something is definitely afoot in this historic town, and as the film develops we find out whether Heidi is going mad, or if the Lords of Salem really are coming back to reek havoc and revenge on Salem. The film starts out in quite a compelling way. Expectations aren’t high as horror films in general are very subjective depending on how much you take to the genre, but within the first thirty minutes the film seems relatively accessible to all. We follow the central character Heidi – a recovering drug addict, with a minor level of local celebrity due to her position as a well known DJ as she sets the scene of her everyday life: sleeping, struggling to wake up at a decent hour, living in a managed apartment block and working in quite a cool job covering the late shift with two other DJ’s. There’s a good level of intrigue into how the story is going to progress, and Sheri Moon Zombie holds her first leading lady role quite well. She represents a character who isn’t flawless, but not too damaged at the same time. She doesn’t dwell obviously on her previous past addictions, yet we are aware of it. She lives a relatively solitary life, yet is friendly to those around her and so you believe who she is, and why the story is centering around her. Rob Zombie also eases the audience in to Salem’s dark history with flashbacks to a group of women (The Lords) practicing demonic rituals back in 1692, and provides the link from history to the modern day story by showing these women ultimately casting a curse over Salem and the descendants of the Judge condemning them to death. These flashbacks appear periodically throughout the film, helping the story move along, however feel more and more surreal as time passes. Throughout the film you realize that Heidi herself is directly affected by the history of Salem, and particularly when she hears the music from this record that she cannot help but play again and again. Its interesting to see her natural human inquisitive nature to this strange gift and how the symptoms she experiences force her to question her sanity and well being and puts her own history with drug addiction back in the forefront of both her own mind and that of those around her who care about her. This slow demise keeps the audience engaged and inquisitive enough to keep watching the film, but unfortunately, its at this point that Rob Zombie decides to inject his own movie “rock n roll”, which sadly makes the film much more problematic than it actually needs to be. One of the great problems, of The Lords of Salem is its spiraling tumble into absolute absurdism. You know it’s never a good sign when the audience burst out laughing during a horror/thriller movie. The two just don’t normally go together, but sadly was the case during the Lords of Salem. As the ‘Lords’ get closer and closer to returning to Salem and completing the curse, the characters that come with them get more and more bizarre. The landlady of Heidi’s apartment block seems initially as a sweet and caring aid, but with the appearance of her “multi-accented” sisters, they almost become a comedic trio, full of stereotypes reading palms, tea leaves and minds…. The flashbacks also become more absurd and begin using every demonic reference in the book – previous devil spawn incantations, burning witches on pyres, goats, upside-down crosses phallic symbols and references and lots of unnecessary nakedness. The problem here is that although these are obviously referenced in history books or occult resources, they don’t all need to be featured in one film and certainly not for the sake of being featured. Time and time again the audience found themselves looking around at each other as a lot of this didn’t make sense. 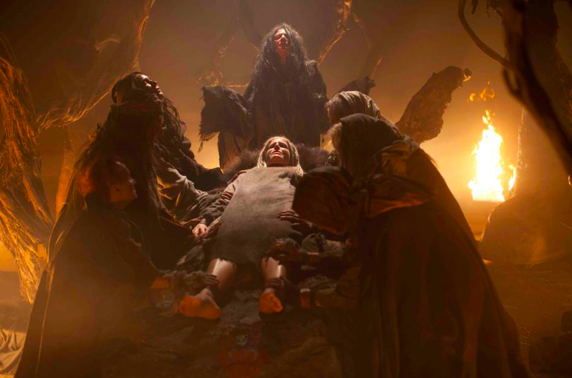 The grand finale of The Lords of Salem felt very likened to the LSD scene in the musical Hair. It featured lots of oversized characters that just seemed to have been raised from the pits of hell for no real reason other than to provide an eclectic setting to finish the film, which frankly left the majority of the audience baffled. Overall, if you’re after something surreal then maybe The Lords of Salem is one for you. It doesn’t build tension enough to feel like a true horror/thriller film or provide enough believable reference to make you feel that given the history this film could be based on any sort of fact – or made to look like that. It’s not a hard watch and it certainly will keep you guessing, but whether that is guessing in a good way or bad way remains to be seen. Move over The Hunger Games and Twilight, there looks like a new bestselling book come film adaptation in the mix with The Mortal Instruments. And if the announcement that it was going to be made into a film wasn’t enough then fan boys and girls prepare yourself for the brand new trailer!! Looks pretty good doesn’t it! Well for those of you unfamiliar with the story, here’s a little more information for you…. 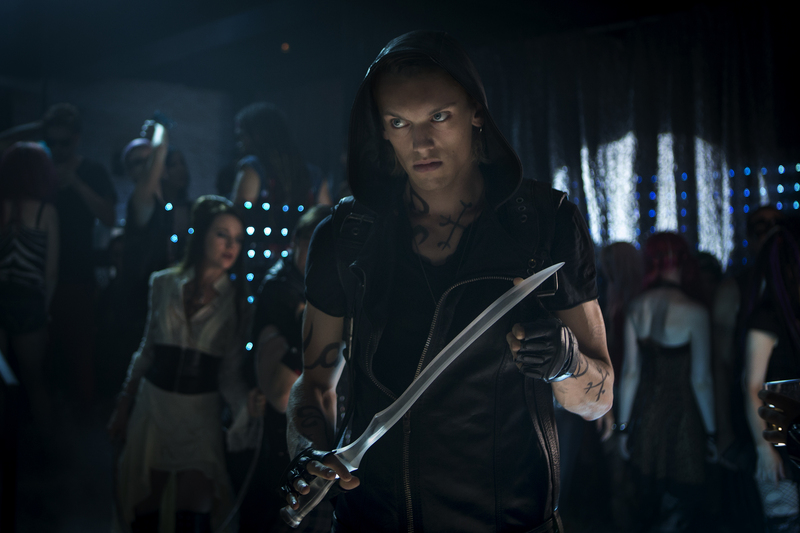 Jace Wayland (Jamie Campbell Bower) is a Shadowhunter. Part of a secret cadre of half-angel warriors, he is tasked with protecting humanity in an ancient battle against demonic forces. This battle has been fought secretly in our midst for centuries, but the stakes have just been raised. When Clary’s mother is viciously attacked and taken from their home, she discovers her connections to Jace run deeper than she could ever have imagined and beneath surface of the city exists another world…one she unknowingly belongs to. As both Clary and best friend Simon (Robert Sheehan) are drawn into this dark and dangerous world, Clary realises Jace is both the key to uncovering her past and protecting her future. Based on Cassandra Clare’s bestselling novel, The Mortal Instruments: City of Bones is directed by Harold Zwart and also stars Jonathan Rhys Meyers and Lena Headey. 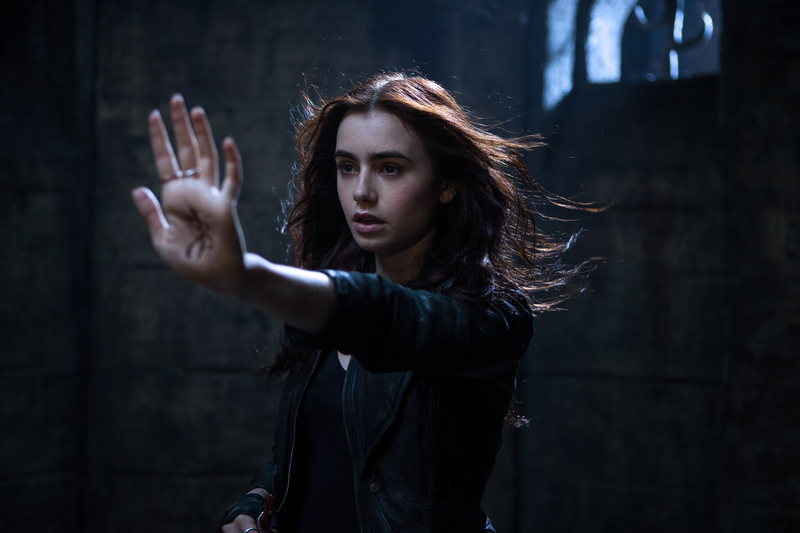 The Mortal Instruments : City of Bones hits cinemas on AUGUST 23rd 2013. Up for five Academy Awards this year, and already a Golden Globe in the bag for supporting actor Christoph Waltz, Django Unchained really is playing the underdog game well and becoming a strong force to be reckoned with. With its bold slavery storyline, homage to Spaghetti Westerns and signature Tarantino style, this film see’s its director assemble a stellar cast and return to his Pulp Fiction best. The film is essentially split into two stories. 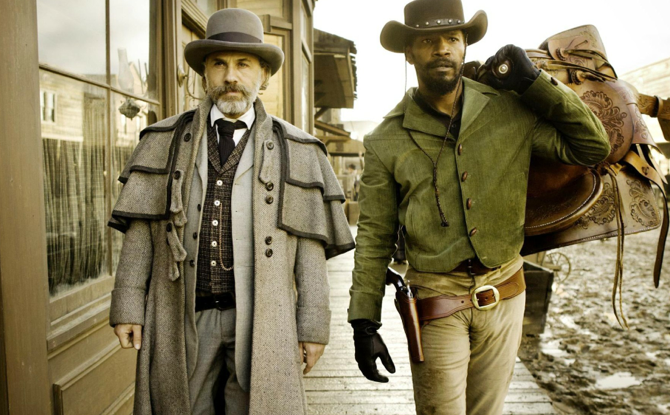 The first, being the uniting and unlikely friendship between a German Bounty Hunter, Dr. King Schultz (Christoph Waltz), and slave turned bounty hunter Django Freeman (Jamie Foxx). The second, being the quest to find Django’s slave wife Broomhilda (Kerry Washington) who is being held by a brutal plantation owner in Mississippi. From the outset, Tarantino puts his personal spin on this big issue of slavery and plants it in the Deep South in an exciting modern Western format. 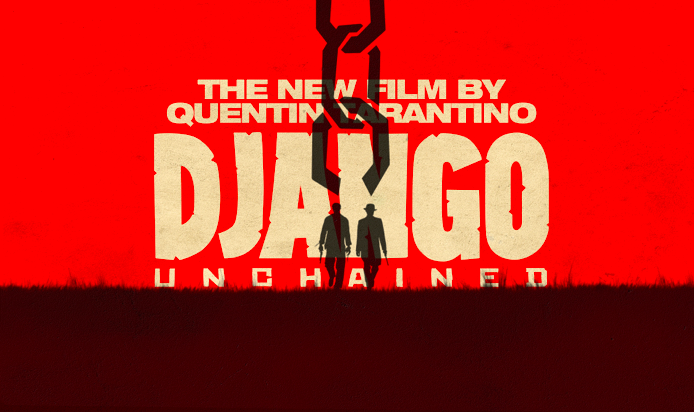 Having heard some time ago about Tarantino’s plans to make this movie, I felt it was an interesting and exciting move, but with unpredictability from audiences, Django Unchained was never going to sit in the middle of people’s opinions. But I am pleased to report that in my book, it is being hailed more as a triumph with controversy rather than a failed attempt. The many great things about this film begin with the performances. Christoph Waltz shone so brilliantly in Inglorious Bastards and he continues his ‘Best Supporting‘ competition campaign in this film. From start to finish he embodies the unassuming Dr. King Schultz with a jolly European elegance that you can’t help but find endearing, even when at his most violent and unforgiving. Jamie Foxx is perfect casting as the titular character, and I doubt there has ever been a remorseless revenge hero quite so straight faced as he is throughout this film – when he finally cracks a satisfied smile in the end scene the relief is welcomed with open arms. Letting Schultz do the majority of the talking on his behalf so he can play the sultry side-kick, allows this duo to work together in harmony as both a ruthless partnership in the first half and with genuine comradery in the second. In addition to these drivers of the narrative, Leonardo Di Caprio plays so against type in this film it’s genius. Girls who grew up falling in love with him in Baz Luhrmanns’ Romeo and Juliet wouldn’t, after watching this film, entertain being in the same plantation let alone the same room with his repugnant, baby-faced, spoilt and menacing Calvin J. Candie. 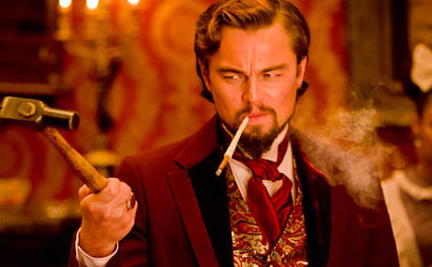 This role shows DiCaprio switch from upper classed Southern-drawl charmer to manipulating and loathed sadist – a role every actor would have desired but few would have been able to accomplish quite in this way. 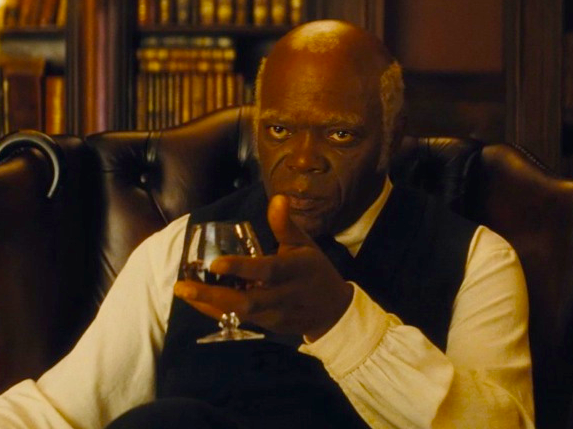 Just as Django and Schultz have an unlikely partnership, so does Calvin Candie and Stephen (Samuel L. Jackson), the cheeky Head of the Household at Candyland who demonstrates that not all slaves are fighting for the same cause necessarily, and that this is a world where even the slightest bit of privilege may skew the utilitarian factor from his mindset. Throughout the upcoming awards season, one can only wish that there would have been room for more nominations for supporting cast members as they were all so brilliantly portrayed. In terms of directing duties, what Tarantino does brilliantly here, is provide not only a great epic American Western with fantastically well thought out characters and intriguing plotlines, but he also shows both the best and very worst of the human spirit – Christoph Waltz’s democratic Dr Schultz, who cared not for the colour of the skin but only the good of the job, and Calvin Candie’s degrading abuse of his slaves show the two extremes here very cleverly. Tarantino also manages to balance the humour, making us laugh at the most absurd scenes and allowing audiences to question and second-guess themselves after viewing the film – the Klu Klux Klan scenario is a good example of this type of humour, and is one of the best scenes of the whole film. So what is bad about this film? Well, firstly it’s long, just how long is one of the many jaw-dropping moments presented when you check your watch as you peel yourself out of your seat once the lights go up. But actually, upon reflection, you’ll find it hard to discover many wasted minutes. Every part of the dialogue is carefully constructed and thought out, and although there are slower parts, they are necessary to provide a pathway towards the more climactic moments. Secondly, it’s violent, but what did you expect? 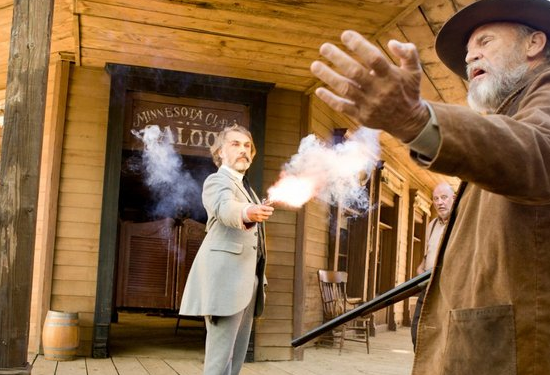 It is Tarantino after all, and if you learned anything from Kill Bill, it’s that Tarantino likes adding in the gore element – but in Django Unchained, you wont see any group slaughter scenes in black and white to shade the violence. However, like in some of his earlier films, the end shoot out is almost so grotesque that you don’t wince when watching it, as it doesn’t evoke that kind of reaction because it is so expected of Tarantino. Equally, the more brutal parts are implied rather than shown in full i.e. : the slave and the dogs, so you are shocked by the horror of it happening but not by seeing it on screen. But what we must remember is that this isn’t just Tarantino going for a shock factor joy ride with his film making, in fact, Spaghetti Westerns of the 1960’s indulged in extreme violence, and to pay proper homage to that era Tarantino is bringing some of that cinematic history to the modern stage. Finally, the extended use of the ‘N-word’ has been steeped in controversy, however when you’re not seeing slaves pulled apart by each other in a death match or set on by dogs it’s a necessary reminder of the horrors of slavery and not a tip toeing premise to hide behind. As with the rest of Tarantino’s portfolio of work, if he’s going to tackle a topic be it Nazi Germany or the Deep South, he does it full throttle. So should you go watch this film? For Tarantino fans this is a must, when questions started to arise about this director through his Grindhouse homage phase that didn’t quite hit the mark, rest assured that he has steadily been building up to this crescendo, lets hope his future projects maintain this level of courage and craft.